Playwright-in-residence John J. King (center) with Fresh Ink literary director Jessie Baxter and director of library services Michael Colford at the Boston Public Library. 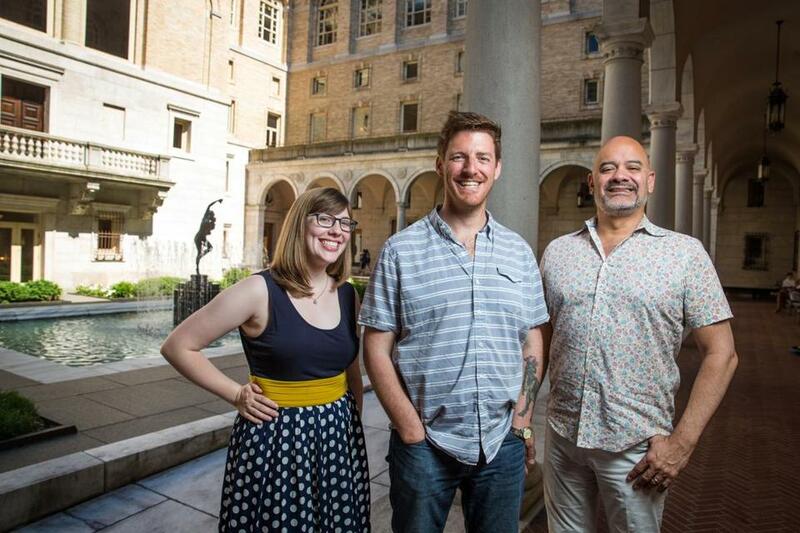 Writing in the library courtyard is part of King’s new role as the BPL’s first playwright-in-residence. Colford and the BPL partnered with Fresh Ink Theatre, a company dedicated to developing new work that has used the Rabb Lecture Hall for play readings. Besides the requirement that the playwright use library resources and lead some workshops at the branches, Colford says he is letting Fresh Ink drive the creative process. The exhibit, “Regions and Seasons: Mapping Climate Through History,” runs through Aug. 27 and features more than 60 maps and objects related to tracing weather data, dating from the 15th century to today. King’s play, called “Martha’s (b)Rainstorm,” imagines the ways in which Bostonians adapt after a catastrophic flood. Those books, often credited with inspiring many video game scenarios, make the readers the protagonists, taking them to a turning point in the story and then offering a variety of options to follow, each of which leads to a different conclusion. Boston, says King, provides a unique perspective on his theme. King is still in the research stage, immersing himself in the historic maps of Boston, interviewing contributors to the city’s evolving Climate Action Plan, contemplating John Singer Sargent’s complex “Triumph of Religion” murals at the BPL, and putting ideas down on paper in the McKim Courtyard. The first public reading of “Martha’s (b)Rainstorm” will be held at the end of the summer, and audience responses will help King shape and revise the script further. A workshop will be held during the fall and winter, with a staged reading in May or June of 2018. While working on the play, King will also visit some branches, offering writing workshops. Actor Keith Hamilton Cobb brings his award-winning solo play, “American Moor,” to the Boston Center for the Arts Plaza Theatre July 19-Aug. 12. The play explores the experience of a black actor auditioning for the title role in William Shakespeare’s “Othello.” As the actor struggles with the expectations and assumptions of white decision-makers, the play becomes an exploration about race and asks the question of who gets to make art in America and whose perspective matters. Tickets to the 85-minute play are $25-$35. Call 617-933-8600 or go to www.bostontheatrescene.com.